Warm the beans in a sauce pan. Add cumin and garlic powder to the beans. Bring to a simmer to heat the beans through. Remove from heat and stir in the cilantro. Cut a medium sweet potato into 1-inch chunks. Pre-heat the oven to 425. Add a dash of olive oil and toss until the sweet potatoes are coated. Place the sweet potatoes on a single layer on the baking sheet. Bake, until the sweet potatoes are slightly browned and roasted, about 25- 30 minutes. Cook rice per directions on package. 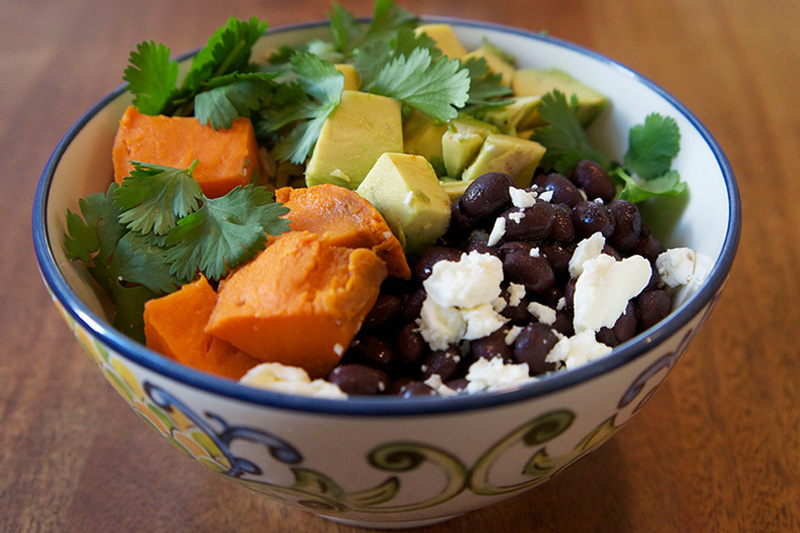 Place rice, beans and sweet potato in bowl, top with chopped avocado, salsa, cilantro and feta cheese.